The Improved Order of Red Men, a fraternal organization which once was very active in Camden and Camden County, is best remembered in the city of Camden for having built the monument and statue which stood for over 60 years in Pulaski Park, on Haddon Avenue south of Benson Street, the present site of the University of Medicine and Dentistry of New Jersey Camden Campus. The monument, which is topped by a bronze statue of an American Indian Chief, was erected to memorialize South Jersey members of the group who had died while serving with America's armed forces during World War I. Nicola Berardo, a sculptor who lived in Camden, was commissioned to execute project. In 1981 Pulaski Park was demolished to make way for the University of Medicine and Dentistry of New Jersey Camden Campus. This statue and a statue of General Pulaski were supposedly put in storage, to be re-erected in Camden. This, however, was not the case, as this monument was taken to Route 9 and Center Street in Tuckerton NJ, where it was rededicated on May 21, 1981. The Pulaski Monument was taken to Cooper River Park in Pennsauken NJ. In 1886 George Reeser Prowell wrote the following account of the Red Men and their female counterparts, the Daughters of the Forest for his book History of Camden County, New Jersey. IMPROVED ORDER OP RED MEN. This order claims its origin as a patriotic association under the title of Society of Red Men, composed of volunteers who were in garrison at Fort Mifflin, on the Delaware River, opposite Red Bank, in 1813. It is a fraternal and benevolent organization, with its ritual based upon the customs of the North American Indians. The officers are known as Sachem, Sagamore and Prophet, and the members as warriors and braves, while the era dates from the landing of Columbus, and their time is divided into grand suns, moons, suns, runs and breaths. The subordinate body is called Tribe, that of the State, Great Council, and of the country, Great Council of the United States. The Great Council of New Jersey was instituted in Trenton, by Great Incohonee Robert Sullivan, there being at the time three tribes in the State - Arreseoh, No. 1; Lenni Lenape, No. 2; and Red Bird, No. 3. These were under its jurisdiction. IROQUOIS DEGREE COUNCIL, No. 3, was instituted December 18, 1884, the Great Chiefs present being: G.P., Daniel M. Stevens; G.S., Reuben L. Bowen; G.J.S., Samuel L. Durand; G.C. of R., John T. Davies; G.K. of W. Charles G. Zimmerman; D.G.S., Leonard L. Roray. The first Chiefs were: P., David B. Petersen; S., George W. Ewan; S.S., J.C. Mason; J.S., George Walters; C. of R., D.C. Vannote; K. of W., Tobias Altman. The present Chiefs are: P., J.C. Mason; Sachem, Frank Applegate; S.S., Lemuel Pike; J.S., Augustus Barto; C. of R., F.H. Drake; K. of W., Tobias Altman. The number of members is thirty-five. The council meets on the second and fourth Tuesdays of each month, at Broadway and Kaighn Avenue. Among its members are these Past Great Sachems:’George W. Watson, John T. Davis, Charles H. Gordon, Thomas J. Francis and Daniel M. Stevens; and of its Past Sachems these are living: Timothy C. Moore, Henry A. Breyer, Lewis Zeigler, Samuel J. Fenner, Edward J. Steer, William F. Farr, Samuel D. Watson, George Horneff, George A. Cairoli, Thomas J. Rowand, Samuel A. Owens, Benjamin M. Braker, Lambert Banes, George Pfeiffer, William Sheridan, Thomas F. Muckelson, Hope Sutton, James P. Moore, D.D. Worts, Leonard L. Roray, Benjamin J. Price, John A. Hall, B.S.M. Branning, Abraham Davis, Harry B. Garrison, Walter E. Garwood, George A. Rogers, William C. Davis, Frank P. Jackson, H. Frank Pettit, John A. Harbeson, John Quick, Angus B. Cameron, Lewis Z. Noble, George Leathwhite, Conrad F. Austermuhl, John K. Seagrove, Charles L. Vansciver, Harry Hoffman, Harry B. Tyler, James H. Reeve and George W. Davis. The officers are: P., G.W. Davis; S., Edward Francis; S.S., Samuel Baker; J.S., Joseph Watson; C. of R., L.Z. Noble; K. of W., C.F. Austermuhl; Trustees, T.J. Francis, T.F. Muckelson, J.K. Reeve, Leonard L. Roray and H.F. Pettit. OTTAWA TRIBE, No. 15, was instituted in Washington Hall, in the Wigwam of Lenni Lenape, June 2, 1868, by Great Sachem James A. Parsons, G.S.S.G. Charles H. Gordon; G.K. of W. Charles H. Chew and G.C. 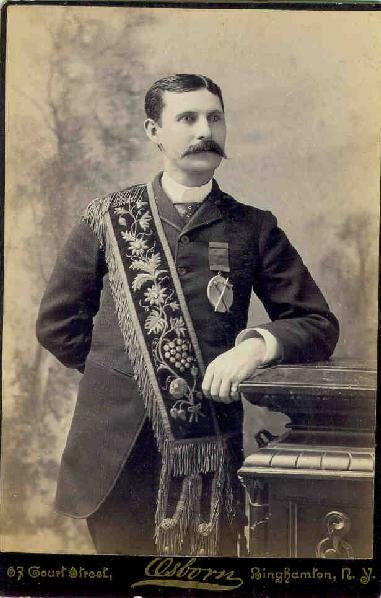 of R. John T. Davis, who initiated and installed the following: Samuel S. Radcliff, P.; George A. Driesback, S.; Andrew Snyder, S.S.; Richard Elwell, J.R.; Edward L. Duffell, C. of R.; Joseph L. Bright, K. of W.; James Smoker, Wm. Soper, Ristine Lippincott, Charles Watson, John Haverstick, Charles H. Jeffries, Charles H. Pugh, Thomas Platt, Leonard Smith, Isaac P. Stone, A.W. Hutchinson, Chas. A. Layer, E.W.N. Custus, Chas. Clendening, George W. Myers, Thos. J. Sparks, John Crookshanks, Josiah Matlack, Edward Renshaw. Of the thirty-six Past Sachems, these are still members: Joseph L. Bright, John W. Matlack, John Shelhorn, Thos. J. Sparks, Wm. H. Gill, Henry R. Snyder, George Roth, Edward C. Sparks, Frank H. Tice, Isaac Lippincott, George A. Saunders, Elisha Chew, Ernest D. Chafey, Frederick Wahl, Wm. A. Aikens, Clark Osler, John Fox, Jr;, Levi B. Randall, George W. Ewan, Wm. J. Titus. 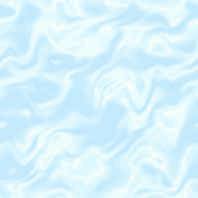 There have been adopted into the Tribe nine hundred and ten pale-faces and the membership numbers four hundred and forty-one. The aggregate income since the institution of the tribe has been $34,120.44, and the expenditures, $27,495.84; balance on hand and invested July 1, 1886, $6,624.62. The officers are - Prophet, Wm. J. Titus; Sachem, Nelson Lyons; Senior Sagamore, John R. Gordon; Junior Sagamore, Frank H. Randall; Chief of Records, Joseph L. Bright; Keeper of Wampum, Levi B. Randall; Assistant Chief of Records, Harry Sharp. The meetings are now held in Central Hall on Thursday evenings. WYOMING TRIBE, No. 55, was instituted July 8, 1880. The Great Chiefs present were Great Prophet, Wm. P. Hall; Great Sachem, James M. Smith; G.C. of R., John T. Davis. 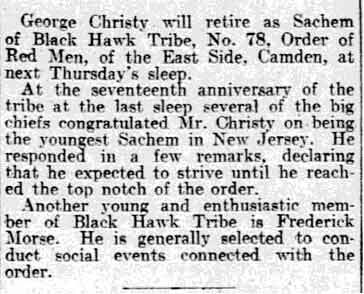 The first Chiefs of the tribe were Prophet, Joseph H. Minnett; Sachem, Alonzo Bicking; Senior Sagamore, Chas. 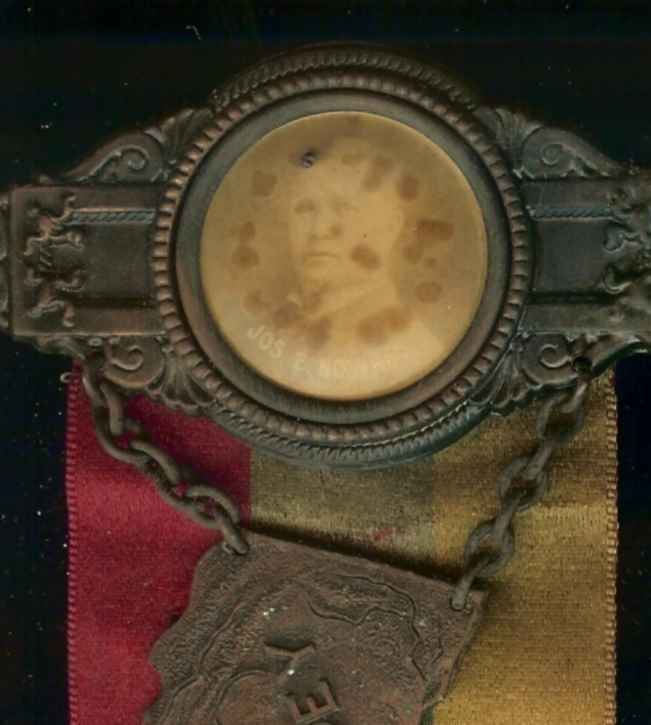 G. Zimmerman; Junior Sagamore, Wm. F. Propert; C. of R., D.C. Vannote; K. of W., Jos. B. Fox. The present Chiefs - P., John A. Dold; S., Henry C. Boddy; S.S., Wm. B. Bignell; J.S., Wm. J. Boddy; C. of R., D.C. Vannote; K. of W., J.B. Fox. The number of members is one hundred and fifty-eight. The lodge meets Wednesday evenings at Third and Market Streets. METAMORA TRIBE, No. 71, was instituted June 4, 1884, with the following Great Chiefs present: G.P., Daniel M. Stevens; G.S., Reuben L. Bowen; G.J.S., Samuel L. Durand; G.C. of R., John T. Davis; G.K. of W., Charles G. Zimmerman. The first Chiefs were - P., Edgar Hardcastle; S., Richard T. Bender; S.S., Joseph Rubicon; J.S., Wm. B. Reeves; C. of R., Robert King, Jr.; K. of W., John H. Daniels. The present Chiefs are - P., Jos. C. Jeffries; S., Geo. Walters; S.S., Wm. H. Stone; J.S., Geo. W. James; C. of R., Robt. King, Jr.; K. of W., John H. Daniels. The number of members is one hundred and thirty-one. Meetings are held Friday evenings at Broadway and Kaighn Avenue. SIOUX TRIBE, No. 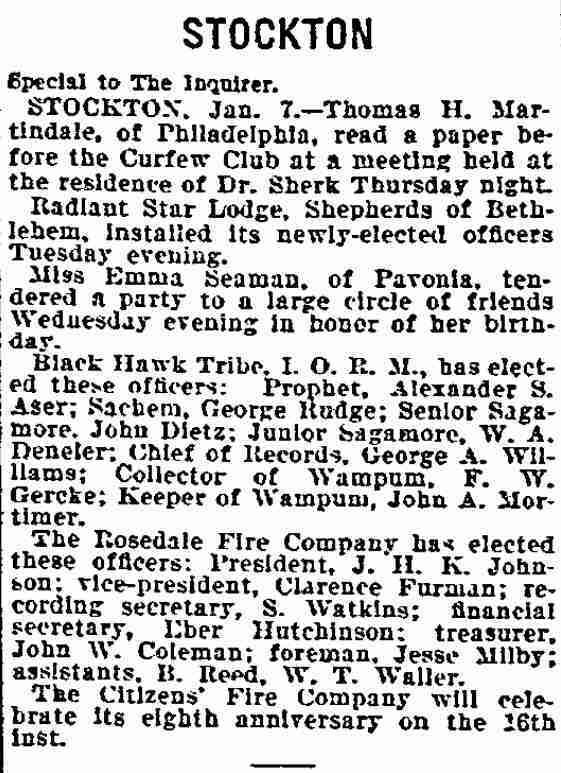 25, was instituted in Wildey Hall, March 28, 1871, by Great Sachem John E. Cheeseman, with members of Sioux Tribe, Philadelphia, who presented them with a set of tomahawks, still in use. The officers were: S., Silas Letchford; S.S., John A. Parker; J.S., John Fox; C. of N., F.W. Wilson; K. of W., David C. Vannote; Prophet, Theodore L. Parker. 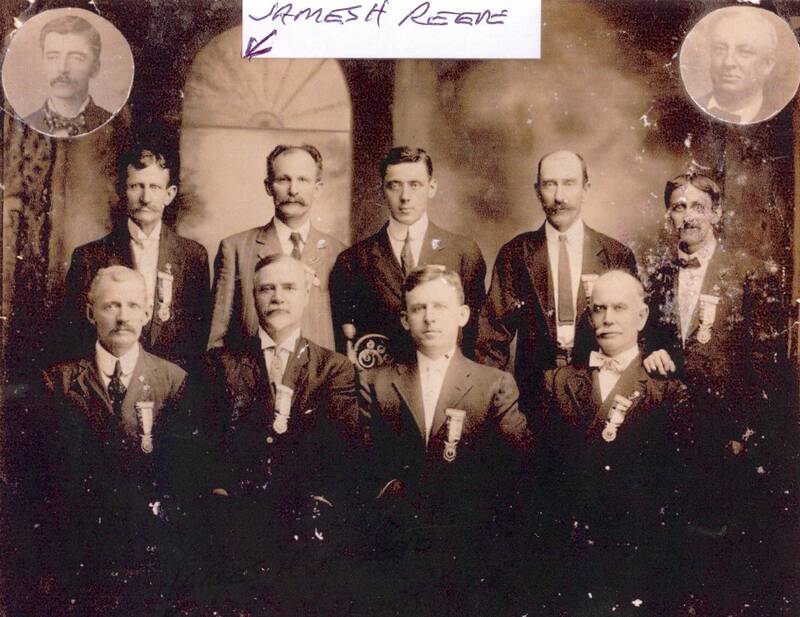 The Past Sachems are Silas Letchford, James Broughton, Aaron Hand, William T. Mears, William F. Mason, Samuel H. Deal, Sr., John H. Mason, W.E. Campbell, Charles H. Hagelman, Henry F. Snyder, George A. Fenner, Isaac King, Theodore L. Parker, David B. Peterson, John B. Wright, William Hagelman, James Barton, Edward B. Chew, George W. Kleaver, J.P.R. Carney, James C. Mason, Edward A. Martin and John Barrett. 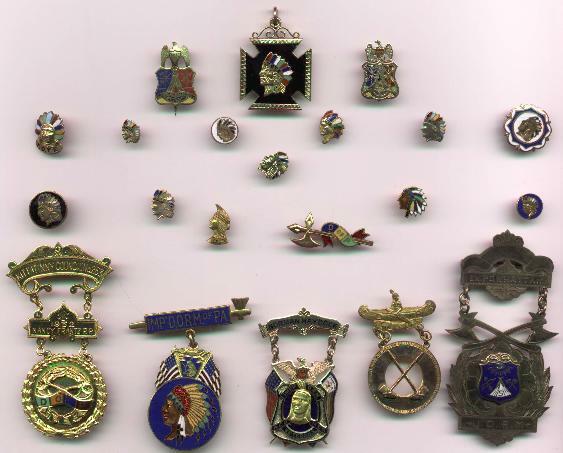 The officers for 1886 are: S., James G. Smith; S.S., Franklin H. Drake; J.S., Daniel England; P., J.P.R. Carney; C. of R., John P. Wright; Assistant C. of R., David B. Peterson. The tribe has a membership of two hundred and ninety-three, and a reserve fund of $455.76. GRAND COUNCIL IMPROVED DAUGHTERS OF THE FOREST. - The First Council Fire was on the Ninth Sun of the Traveling Moon, October, 1874. The officers for 1886 are: G.V.P., Mrs. Kate Tyler; G.N.I., Mrs. Mary A.F. Ward; G.W.I., Mrs. Mary M. Davis; G.G.W., Mrs. Mary Cline; G.C. of R., Mrs. Cornelia Cox; G.K. of W., Mrs. Hannah G. Ivins; G.G. of T., Mrs. Stratton; G. of F., Mrs. Mary E. Corcoran. Number of Grand Council members, one hundred and thirty. The Grand Council meets four times yearly at Wildey Hall. The number, of subordinate tents is ten, as fellows: Cherokee Tent, No. 1; Lenni Lenape, No. 2; Morning Light, No. 3; Sioux, No. 4; Ottawa, No. 8; Manumuskin, No. 11; Wyoming, No. 12; Delaware, No. 13; Tippecanoe, No. 14; Osceola, No. 15. The total number of subordinate tent members is one thousand four hundred and twenty-four. CHEROKEE TENT, No. 1, was organized January 18, 1858, at Fourth and Spruce Streets, the officers being: V.P., Rebecca Seagrave; N.I., Lena Leon; W.I., Alice Piper; G.W., Cecilia Hanley; First Squaw, Abbie Doughty; Second Squaw, Anna Smick; Third Squaw, Caroline Carregan; Fourth Squaw, Rosa Schregler; K. of T., Susan Weaver; K. of F., Julia Coleman. Meetings are held Tuesday evenings, at the northeast corner of Third and Federal Streets. The members number eighty-two. LENNI LENAPE TENT, No. 2, was organized as Chippewa Tent, No. 3, February 21, 1868, by Great Noble Incas Elizabeth Strumpfer and Great Chief of Records Mary A. Furter, assisted by the Great Council of Pennsylvania. Fifty-three, constituting the charter members, were initiated, and these officers installed: Noble Incas, Sarah Y. Winner; Worthy Incas, Roselina E. Smith; Prophetess, Rebecca M. Thompson; Good Watcher, Hannah G. Ivans; Chieftess of Records, Susannah Poole; Wampum Scribe, Cordelia Matlack; Worthy Keeper of Wampum, Margaret W. Boyd; Squaws, Ruth A. Ross, Elizabeth North, Clara Muckelson, Mary M. Lindale; Keeper of the Tent, Margaretta Hampton; Keeper of the Forest, Camilla Sloan. In September, 1868, the name was changed to Lenni Lenape Tent, No. 2, and the meeting-place afterwards changed to Wildey Hall. 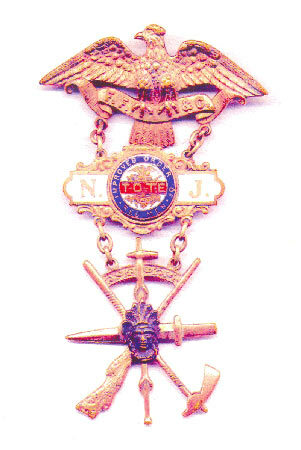 The tent has sixty-two past officers, three Past Grand Officers, and is working under the Great Council of New Jersey. The membership numbers eighty, and since 1869 one thousand eight hundred and ninety-six dollars has been paid for sickness, and five hundred and ninety-five dollars for funeral benefits; since the formation two hundred and eighty-eight have been initiated. The wampum on hand amounts to one thousand dollars. 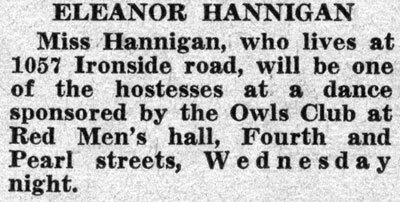 The officers are: W.P., Roselina E. Smith; N.I., Emma A. Pierson; W.I., Keturah Tenner; G.W., Susan Sweeten; C. of R., Rebecca M. Thompson; W.S., Cordelia Matlack; W. K. of W., Margaret W. Boyd; Squaws, Roxanna Severns, Ellen Walton, Maria Kerens and Elizabeth Campbell; K. of T., Leonora Flowers; K. of F., Rachel B. Stone. SIOUX TENT, No. 4, was organized at Wildey Hall, the Twelfth Sun of Plant Moon, (April,) 1872. The officers for 1886 are as follows: P., Hannah Shettinger; N.I., Rebecca Davis; W.I., Mary J. Vannote; G.W., Sallie Thomas; G. of C., Lizzie Olden; G. of W., Sarah Wiatt; C. of R., Mary E. Corcoran; W.S., Katie Darnell; K. of W., Sarah Letchford; First S., Virginia Ploetz; Second S., Virginia Gonardo; Third S., H. Cavanal; Fourth S., Lizzie Banes. 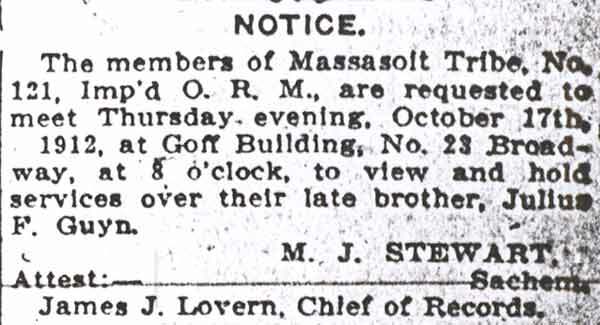 Meetings are held every Tuesday evening at Mechanics’ Hall, southwest corner of Fourth and Spruce Streets. The number of members is seventy-three. OTTAWA TENT, No. 8, was organized January 12, 1874, in Yeager’s Hall. 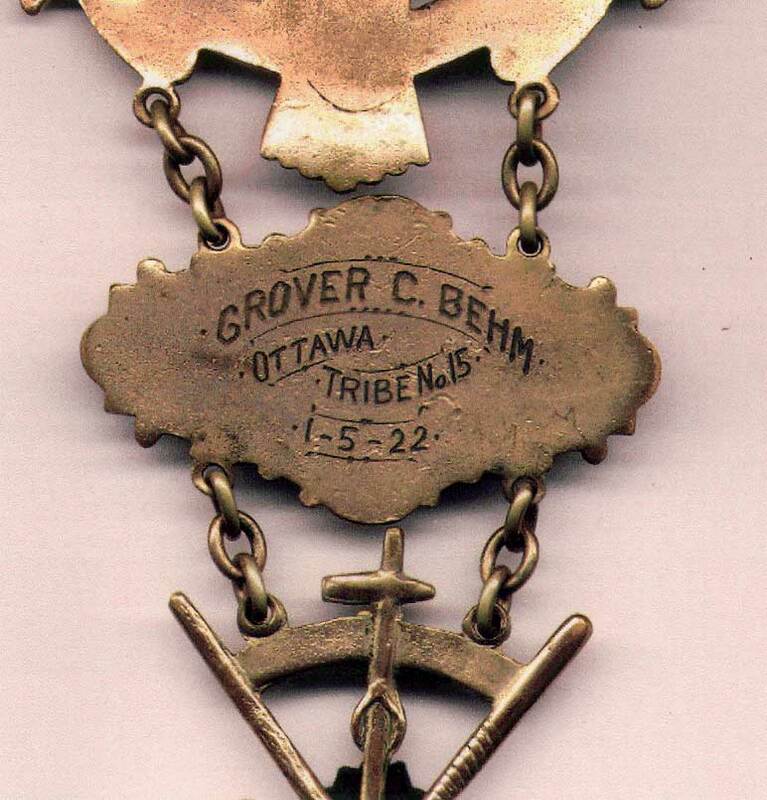 The Past Officers who are members of the Grand Tent of New Jersey number twenty-five, and among the members of Ottawa are two Past Grand Officers. The tent has prospered and has a membership of, one hundred and forty-five, with twelve hundred dollars in the treasury or invested. The officers are: G.P., Mary Sutton; A.I., Mattie Craig; W.I., Sarah Oehrle; G.W., Rose Prickett; C.R., Lizzie Lilly; W.S., Margaret Snyder; K.W., Anna J. Wright; Trustees, Levi B. Randall, William T. Mears, John Matlack. WYOMING TENT, No. 12, was instituted the 28th Sun of Flower Moon (May), 1880. The officers for 1886 are: P., Cornelia Cox; N.I., H.F. Steward; W.I., Mary Houseman; G.W., Henrietta Silance; G. of F., ----- Trullender; G. of T., C.A. Knight; C. of R., Mary A.F. Ward; W.S. Anna Nulliner; K. of W., Annie Williams; 1st Sq., Mrs. L. Broadwater; 2d Sq., Annie Stearn; 3d Sq., Eliza Snow; 4th Sq., Maggie Stone. The number of members at present is fifty-five. Meetings are held every Wednesday evening at Mechanics’ Hall. TIPPECANOE TENT, No. 14, was instituted 9th Sun, Plant Moon (April), 1886. The following are the officers for 1886; P., Fannie Williams; N.I., Emma Morris; W.I., Amanda Hoe; G.W., Minnie L. Wyle; C. of R., Lyda A. Cathcart; W.S., Susanna L. Rupert; K. of W., Susanna M. Ristine; G. of F., Sadie Marembeck; G. of T., Viola S.E. Marembeck; 1st Sq., Annie Wilkinson; 2d Sq., Ella M. Madison; 3d Sq., Minnie Madison; 4th Sq., Emma L. Hemmingway. Charter members; Jane Madison, M.E.D. Morris, Kate Hunt. The tent meets every Friday evening at Wright’s’ Hall, in Wrightsville. The number of members is thirty-two. The Red Men also owned and operated a hall at As early as 1910 and as late as 1929 at 536 Division Street, the corner of Broadway and Division Street. Beginning in the 1920s and through at least 1928 a building on the southwest corner of North 4th at and Arch was utilized. The Labor Temple at Broadway and Royden was lease for a time in the 1920s. 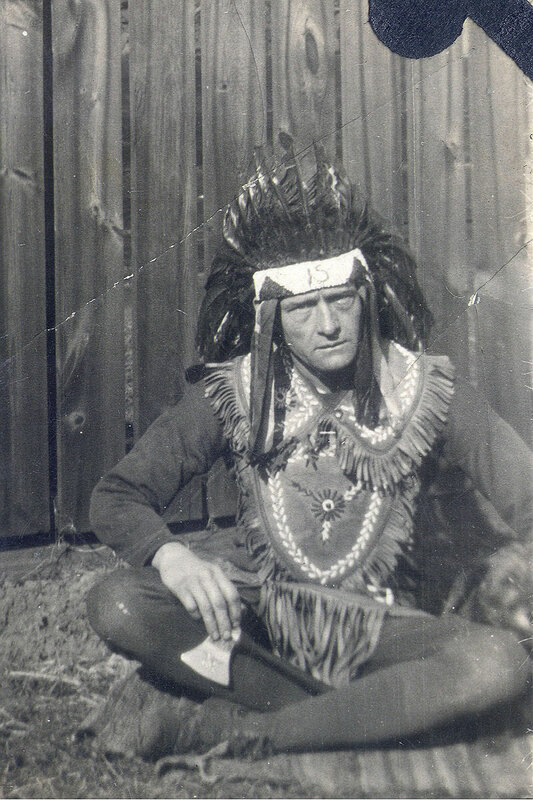 The 1920 and 1930s the Black Hawk Tribe used a hall 715 North 27th Street. These buildings were all known, appropriately enough, as Red Men's Hall, or Halls, to be grammatically correct, By 1929 the Red Men had moved form North 4th and Arch Street to 415 Pearl Street. The Red Men were very active in Camden for many years. Thomas J. Francis, a member of Lenni Lenape Tribe No. 2, was elected to the Great Council of the United States, the governing body of the red men, in 1866 and was elected to the organization's highest post,Great Incohonee in 1888. Mayor Joseph Nowrey was grand marshal for a parade held in the city in 1904, and of course the monument was placed on Haddon Avenue after World War I. Other tribes in Camden County included Standing Elk, Gloucester; Mohican, Haddonfield; Comanche, Atco; Tonawanda, Blackwood; Rancocas, Clementon; Wawa, Berlin; Algonquin, Westmont; Wyandotte, Audubon; and Black Horse, Chews Landing. 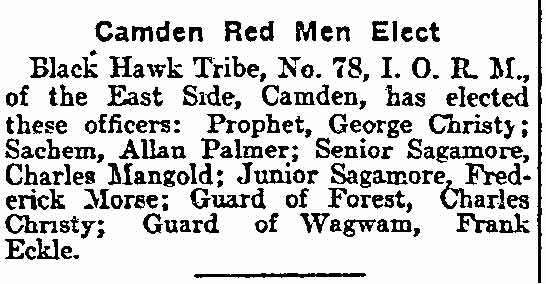 The 1947 Directory shows that only the Wyoming Tribe still maintained a building in Camden, at 417 Pearl Street. Its hardly accurate to describe the Improved Order of Red Men as the first Native American order--they didn’t admit Native Americans. But they were at least among the earliest American orders not imported from somewhere else. Understandably, the order had a hard time during the Indian Wars of the 1880’s. There may be some small individual Lodge sites and there are a few Red Men still around. There are many collectors of their jewelry, probably because of the Indian motif. The Fraternity was founded in 1765 and was originally known as the Sons of Liberty. These patriots concealed their identities and worked "underground" to help establish freedom and liberty in the Early Colonies. They patterned themselves after the great Iroquois Indian nation and its democratic governing body. Their system with elected representatives to governing tribal councils had been in existence for several centuries. After the American Revolution the name was changed to The Order of Red Men. They kept the customs and terminology of the Indians as a basic part of the Fraternity. Some of the words and terms may sound strange, but they soon become a familiar part of the language for every member. The Masons are similar to the Order of Red Men in that they have patterned their rituals and work after the Ancient Masonic Craftsman. The Order of Red Men is a National Fraternal Organization that believes in .. Perpetuating the beautiful legends and traditions of a vanishing race and the keeping alive of its customs, ceremonies, and philosophies. Legally, The Order of Red Men is a Patriotic Fraternity Chartered by Congress. It is a Non-Profit Organization devoted to Inspiring a greater love for the United States of America and the principles of American Liberty. The Order of Red Men traces its origin to certain secret Patriotic Societies founded before the American Revolution. They were established to promote Liberty and to defy the tyranny of the English Crown. Among the early groups were: The Sons of Liberty, Sons of Tamina and the Red Men. On December 16, 1773 a group of men, all members of the Sons of Liberty, met in Boston to protest the tax on tea imposed by England. When their protest went unheeded, they disguised themselves as Mohawk Indians, proceeded to Boston harbor and dumped overboard 342 chests of English tea. During the Revolutionary War, members of secret societies quenched their council fires and took up muskets to join with the Continental Army. To the cause of Freedom and Liberty, they pledged their lives, their fortunes and sacred honors. At the end of the hard fought war, the American Republic was born and was soon acknowledged among the Nations of the world. Following the Revolution the various secret societies founded before and during the conflict continued in existence as brotherhoods or fraternities. For the next 35 years each group went its own way, under many different names. In 1813, at historic Fort Mifflin, near Philadelphia, several of these groups came together and formed one organization known as the Society of Red Men. With the formation of a national organization, the Order of Red Men soon spread, and within 30 years there were State Great Councils in 21 states with a membership of over 150,000. The Order continued to grow and by 1920, tribes in 46 states totaled membership over one half million. Today the Order of Red Men continues to offer all Patriotic Americans an organization that is pledged to the high ideals of Freedom, Friendship and Charity. The same ideas on which the American Nation was founded. A local group of Red Men is called a Tribe, and its Lodge is called a Wigwam. The supreme head of the order is called the Great Inchonee. The officers of a Tribe are: Sachem (chief); Prophet (chaplain); Senior Sagamore (lesser chief); Junior Sagamore (lesser chief); Chief of Records (secretary); Collector of Wampum (financial secretary); Keeper of Wampum (treasurer). 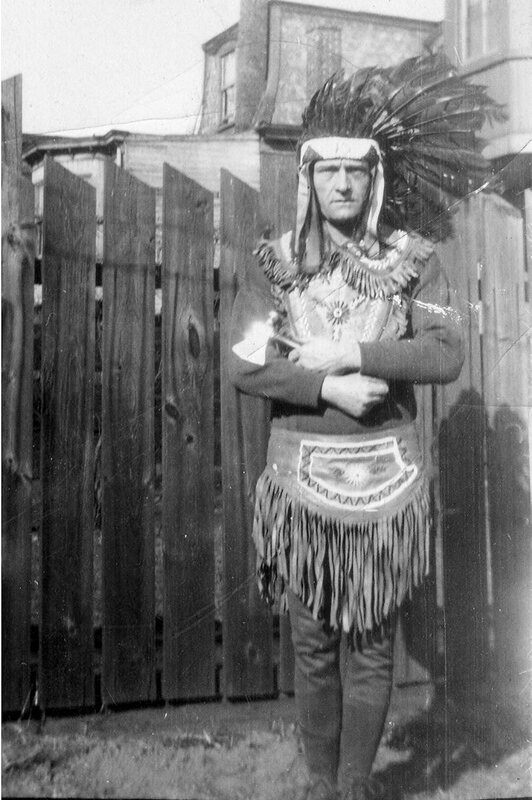 Even though Aprons were abolished as part of the regalia in 1869, regalia initially consisted of both aprons and collars. The collars were color-coded representing each of the three degrees: The initial, or first degree collar was pink (later changed to orange); the second degree collar was blue; and the third degree was scarlet. The aprons were scarlet, trimmed with the color of the degree of the wearer. The Red Men degrees are called Adoption, Hunter, Warrior, and Chief. In the Adoption Degree, a paleface is naturalized into the Tribe. The Hunter's Degree, which is a prelude to the Warrior Degree, illustrated the manners and customs governing the chase, by which the hunters provided nourishment for the tribe. The Warrior's Degree illustrated the manner of enlistment for war. The Chief's Degree illustrated the religious forms and ceremonies of the Indians. The Degrees utilize such emblems as the bow and arrow, tomahawk, war club, wampum belt, peace pipe, and skeleton. The IROM's stated goal is: "to perpetuate the beautiful legends and traditions of a vanishing race and to keep alive its customs, ceremonies and philosophies." The Degree of Pocahontas was created for women on January 15, 1887, drawing on the legend of its namesake and the virtues of her life. In November 1878, the Improved Order of Red Men organized the National Haymakers' Association which was its "fun" or "friendship" branch that was formed in response to the success of the Masonic Shrine of North America which had been founded in 1870. In 1847, the various local tribes came together in Baltimore, Maryland and formed a national organization called the Grand Council of the United States.
" I am confident that in the final analysis we shall find that the stability of our government depends not so much on our armies and navies, though they may be vastly important, but rather, we must depend upon the Brotherhood of Humanity as represented by great force of fraternity. The fraternal societies are one of the greatest powers for good government and the protection of the home that we have in this country. The government will endure just as long as we protect the great interests represented by our fraternal societies." Here are a couple of early Red Men wearing the sash, badge and ceremonial pouches of their Order. Rev. 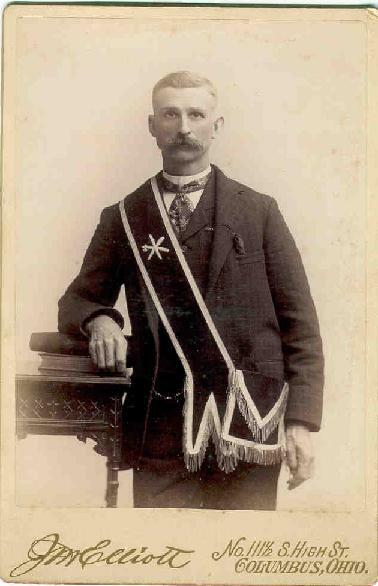 William Grum - Trimble Lodge No. 117 F. & A.M. Delegations from thirteen Camden county tribes of the Improved Order of Red Men, will attend a rally in the interest of the statewide membership campaign at a meeting of Black Hawk Tribe No. 78, at 715 North Twenty-Seventh Street, tomorrow night. Tribes which will attend the rally will be Ottawa, Wyoming, Eyota, Saranac, all of Camden; Standing Elk, Gloucester; Mohican, Haddonfield; Comanche, Atco; Tonawanda, Blackwood; Rancocas, Clementon; Wawa, Berlin; Algonquin, Westmont; Wyandotte, Audubon; and Black Horse, Chews Landing. 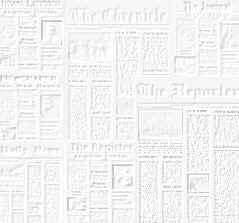 The Tenth Ward Organization Republican Club will hold a rally Thursday night in Wyoming Tribe Hall, Fourth and Pearl streets. A parade will be held tomorrow night to advertise the event. Headed by a band the club members will form in front of the club house at Fifth and Pearl streets and march through the ward. Members of Wyoming Tribe, Improved Order of Red Men. will elect officers tonight at a meeting in the wigwam, 415 Pearl street. Jesse P. Mathews and Ralph C. Sparks are candidates for chief of records. Harry Harrold and Edward Altone are candidates for trustees. Members of the Improved Order of Red Men Tribes in District 19 of the Reservation of New Jersey will hold an outing at Riverview Beach on Sunday. 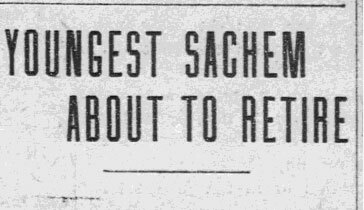 They will go there by boat, leaving the Chestnut street pier, Philadelphia, at 8.30 a. m.
At the beach a varied program of entertainment will be presented, including a ball game between picked players of the Philadelphia and the Camden tribes, as well as swimming races for men and women. It will be an "old-fashioned basket picnic" with other forms of contests for men, women and children. The Wyoming Tribe No. 55, Ottowa Tribe No. 15, Eyota Tribe No. 105, Black Hawk Tribe No. 78. Algonquin Tribe No. 245 and the Councils of the Degree of Pocahontas will participate. 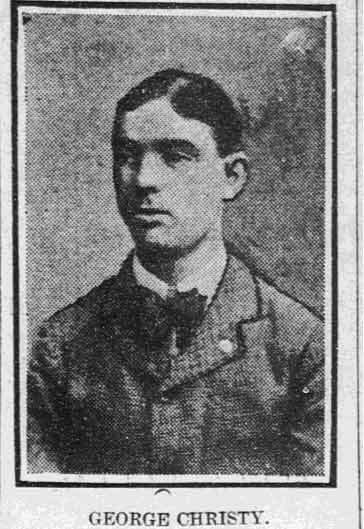 Frank C. Englehart is chairman of the outing committee, whose members include Lawrence Cook, Harry Harrold, Edward Altone, Theodore Haines, Harry Rowan, James Coyle, Thomas Symington, William Rothwell and John O'Neil. .